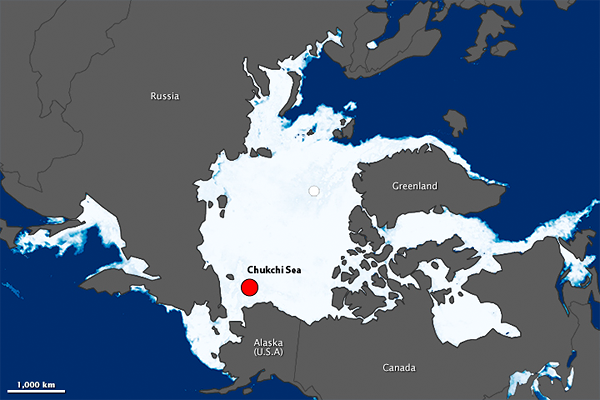 Something startling is happening up north of Alaska in the Chukchi Sea. 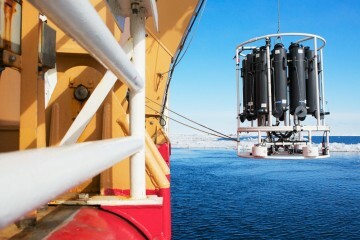 In 2011 a team of scientists aboard the Coast Guard icebreaker Healy discovered a massive springtime plankton bloom, in fact, one of the largest ever observed in the Arctic. 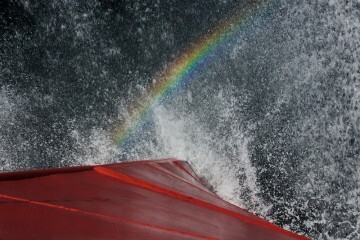 That alone was not so surprising—these are among the biologically richest waters in the world. The startling fact was that this plankton bloom had happened beneath the sea ice. How could that be? Phytoplankton, like other plants, bloom only when nutrients and light are simultaneously present. 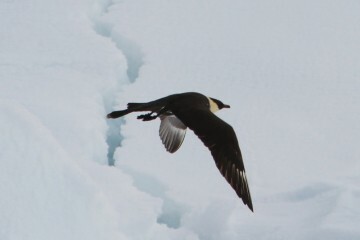 The nutrients were there that spring of 2011—they come north on ocean currents—but everyone had assumed that the heavy ice cover precluded light. 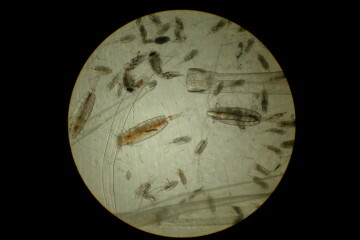 Yet the plankton had bloomed, and massively. Logically, light must somehow have penetrated the ice cover. Everyone knew that Arctic sea ice has radically thinned and retreated during the last decade, that multi-year ice has almost vanished at these latitudes. Had the single-year ice so thinned as to become translucent? Or perhaps those melt ponds, appearing increasingly on the sea-ice surface, were acting like lenses projecting light down into the water column. Or perhaps it was some other mechanism entirely. In any case acres of plankton were blooming beneath the ice where no one thought it possible. Why? How? These questions needed to be answered. They carried profound ecological implications. 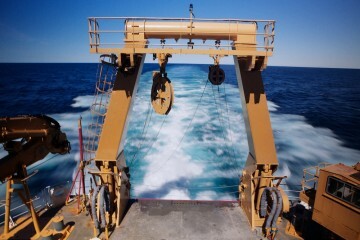 So on May 12, 2014, three of the scientists from that 2011 expedition—Kevin Arrigo (plankton), Don Perovich (sea ice), Bob Pickart (oceanography), with about 150 Coast Guard crewmen and fellow scientists—will head north aboard that same icebreaker into the frozen Chukchi Sea seeking answers. Was the 2011 under-ice bloom an aberration? Or has the sea-ice cover thinned so severely—due to rapid warming in the Arctic—that springtime light routinely penetrates it? If so, if that’s to be the way of the future, then profound change and its attendant peril are in store for the entire Arctic food chain. 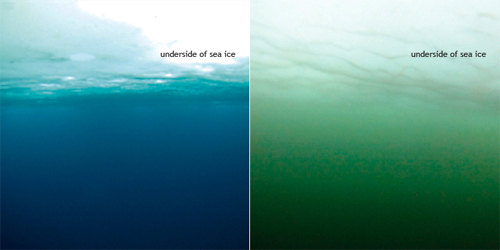 The ocean under the ice before (left) and during (right) a massive phytoplankton bloom. In normal times, the plankton and its riot of photosynthesis occurred only after the sea ice had melted. Only then did the zooplankton come to graze on the phytoplankton; only then did the fish and whales arrive to feast on the planktonic soup; only then the seals to eat the fish, bears to eat the seals, foxes and sea birds to scavenge the leftovers. But the season is short up there, and so is the plankton’s lifespan. If the bloom now explodes too early—before the ice retreats—and then dies prematurely, nature’s precise timetable will be skewed, and the seals, whales, fish, foxes, and birds will arrive too late, finding only barren ocean. But this is pioneering science. We just don’t know. And so we go back to the Arctic. However, we must arrive in the far north before the spring thaw in order to witness and measure the entire lifespan of the plankton bloom. 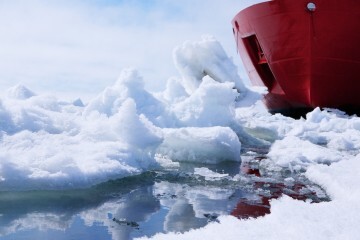 That’s very early in the season; only a full-on icebreaker like Healy holds any hope of bashing and crashing through 1.5 meters of tightly packed sea ice. Come with us, then, to this frozen sea so few people ever witness. 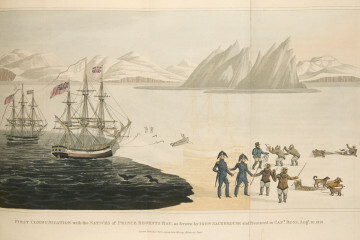 We’ll evoke and reveal the unique experience of daily “icebreaker life,” introduce you to her officers and crew, her technicians and scientists, watch them collaborate for the sake of discovery and understanding; we’ll take you for excursions out onto the ice as the scientists probe for life in the water below; and we’ll portray through diverse media the haunting beauty of the ice and the magic performed on it by the strange Arctic light. If we see the white bears, you will too. Though yours will be a vicarious trip, we’ll do our best to make it vital and alive. We welcome you aboard.